On September 3, the Okinawa prefectural assembly held a special meeting and passed a resolution of protest against the seabed drilling survey being carried out for construction of a new base, which is part of a relocation of the U.S. Marine Corps Futenma Air Station in Henoko, Nago City. The statement requesting an immediate cessation of the construction work was passed with 26 in approval and 14 in opposition. The assembly members from four opposition parties of Social Democratic Pro-Constitution, Kenmin Network, Japanese Communist Party, Social Mass Party, and ruling party Komei Party independent members gave their approval. 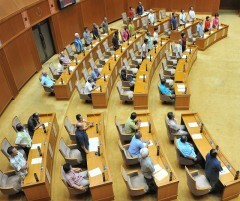 The Liberal Democratic Party members opposed it. Three members of Souzou Party and independent Yasuhiro Arakaki walked out. Regarding the Abe administration’s commencement of the seabed survey, the statement said, “The government has trampled democracy and peoples’ dignity. We will not tolerate it. With anger, we condemn such tyranny.” Then, the statement demanded:1) to immediately stop the building of a new base in Henoko including the seabed drilling survey, 2) to immediately stop excess security and suppression of the protest movement, 3) to remove the iron grid set up in front of Camp Schwab Gate 1, as well as the buoys and floats in the sea.